How Many Carbs Are in a Glass of Merlot? The Merlot grape is soft and round, reflecting plum and cherry flavors. It is grown most commonly in the Bordeaux region of France, though an explosion in popularity has made it a favorite of vineyards in California, Australia, South America, Italy and other areas. There are 122 calories in one 5-fluid oz. serving of Merlot wine, with up to 12 percent of those calories coming from carbohydrate. That translates to about 13.7 carbohydrate calories per serving, or 4 grams of carbohydrate. To be considered low-carb, a 5-fluid oz. glass of wine must contain less than 7 g of carbohydrate, according to the U.S. Alcohol and Tobacco Tax and Trade Bureau. This designates many wines, red and white, as low-carb. The U.S. Department of Agriculture does not require winemakers to list carbohydrate information on their labels. 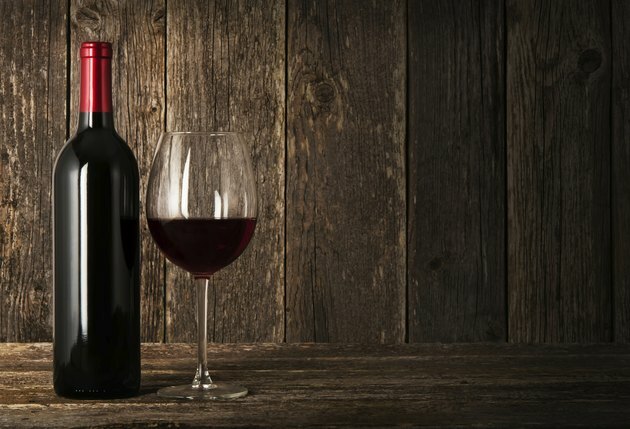 When wine has a carbohydrate value that is just a bit higher than 7 g, the U.S. government permits the usage of the terms "lower carb" and "reduced carb" to describe these varieties. For people who are particularly concerned about the carbohydrate content of Merlot, the brand One.9 Merlot offers 1.9 carbs per 5-fluid oz. glass. It is available through most wine retailers. White Merlot is another type of wine made from Merlot grapes. Because the grape juice is in contact with the grape skins for a shorter time than traditional Merlot, it has a much lighter color and fewer carbs. Carbohydrate content in some varieties of white Merlot can be as low as 3 g.